Monday 10:00am-9:00pm , Tuesday 10:00am-9:00pm , Wednesday 10:00am-9:00pm , Thursday 10:00am-9:00pm , Friday 10:00am-9:00pm , Saturday 9:30am-6:30pm , Sunday 12:00pm-5:00pm . Parkway Mall offer more than 95 brand name stores. 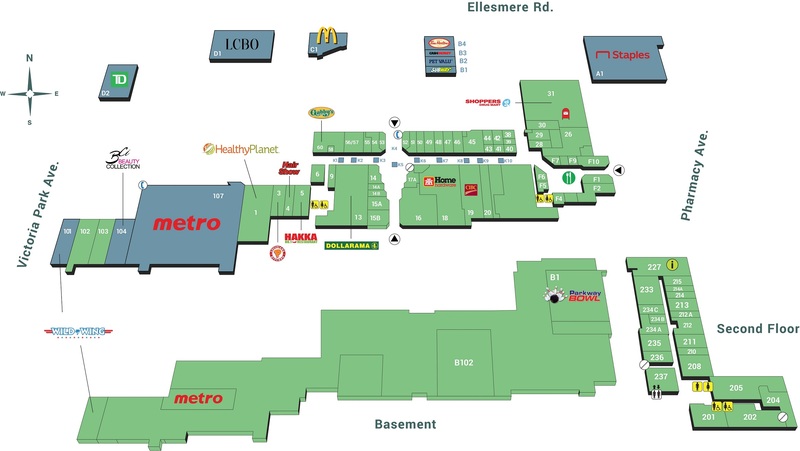 Parkway Mall is located in Toronto, Ontario - 85 Ellesmere Road, Toronto, Ontario, M1R 4B9 (GPS: 43.758247, -79.313843). Look at the list of stores in Parkway Mall, hours, location and information about mall and special events, sales, coupons. You can choose store from list below and get detail information - other stores locations for the brand, location, shopping hours, phone, map, directions contact. Parkway Mall is one of the best shopping place for spend your free time - mall/shopping center has all types of stores - outlets, department, fashion, traditional and more. Have you ever visited Parkway Mall? Do not forget to write shopping review and rate your satisfaction. Directions from North, West, East: Take the 401 to the DVP (South). Exit York Mills Road. East ramp. Proceed East, bearing right on Parkwoods Village Drive to intersection of Ellesmere Road and Victoria Park Avenue. Turn right after crossing the intersection for parking. Directions from South, West, East: Take either the Gardiner Expressway (from the West) or Kingston Rd. (from the East). Merge onto the DVP North. Exit York Mills Road. East ramp. Proceed East, bearing right on Parkwoods Village Drive to intersection of Ellesmere Road and Victoria Park Avenue. Turn right after crossing the intersection for parking. Worst Customer Service! Please be careful everyone when purchasing merchandise from this company... My group recently purchased the same style & colour dress in different sizes after we tried on the sample from the selling floor. They ordered the merchandise and when we picked up the dresses they were extremely wrinkled and in terrible condition. The store owner refused to help and told us that they do not provide the dresses in the same condition as the ones the customer sees on the selling floors. He was extremely rude and actually started laughing at the entire situation. We will never be returning to this store! Valued customers please be very careful when purchasing any products from this company! Give us your experience with Parkway Mall by writing a short review.